1) Season Rockfish with Chef Paul Prudhomme’s Blackened Redfish Magic seasoning and place on a non-stick baking tray. Cook in a 375°F pre-heated oven for about 5-7 minutes or until done. 2) Warm tortilla either in a microwave for a few seconds or lightly toast on a skillet for about 1 minute per side on medium to low heat. 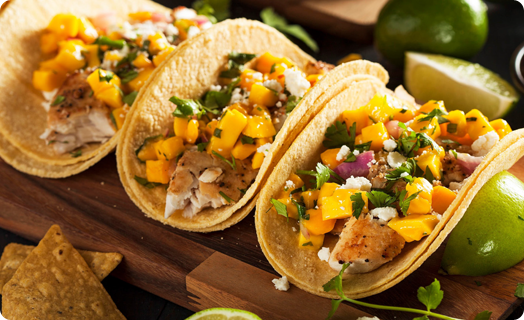 3) Serve taco by adding a piece of Rockfish on 2 corn tortillas, a spoonful of mango salsa, some cilantros and a spritz of fresh lime. Enjoy!